Do you have regrets? Are there things in your life you wish you’d done differently? The things I regret aren’t the major decisions, but instead they are small moments. These seemingly insignificant events are poignant because I let fear dictate my actions rather than following my heart. When we make choices based on fear, we limit ourselves and create a narrow—though supposedly safe—environment in which to reside. Pushing boundaries can be extremely scary as there’s a chance of failure, rejection, hurt, and a host of other potentially undesirable feelings; yet, the rewards can be great. When we feel fear and do it anyway, we expand our horizons and open the door to increased joy, love, and fun. Although you might not know it upon meeting me, I’m quite shy. Over the years I’ve learned to break through my protective shell, but sometimes the little girl who hid under her mother’s skirt creeps back. My inability to speak up for myself has at times prevented me from experiencing my life to the fullest and has sadly left me with some regrets. When I was in 11th Grade I spent the spring semester at a boarding school in Vermont. Some of the Jewish students organized a Passover Seder. Since I wasn’t Jewish, I didn’t sign up to join them. However, as the big day approached and recipes for Bubbie’s special brisket were being sent from home and students were arguing over the best type of kugel, I noticed that some of the non-Jewish students had signed up to take part in the dinner. But, I was still too shy to add my name to the list. By the day of the Seder, every student in the school, with the exception of three, had signed up. But, by that time the sign up sheet had been taken down. With every ounce of my being I wanted to be there, and I was mortified that my friends would think I didn’t want to celebrate Passover with them; yet, I was too shy to say anything. Even as I write this, twenty years hence, my heart still hurts. In retrospect I see that not speaking up was far more painful than it would have been to say what I really wanted. But, unfortunately, sometimes we can’t see clearly when we let fear be our guiding light. A few months ago, I was presented with an opportunity to choose joy over fear, but I nearly chickened out. I was cooking for a retreat, and a woman from Australia mentioned she was going to go to Disneyland after the workshop. 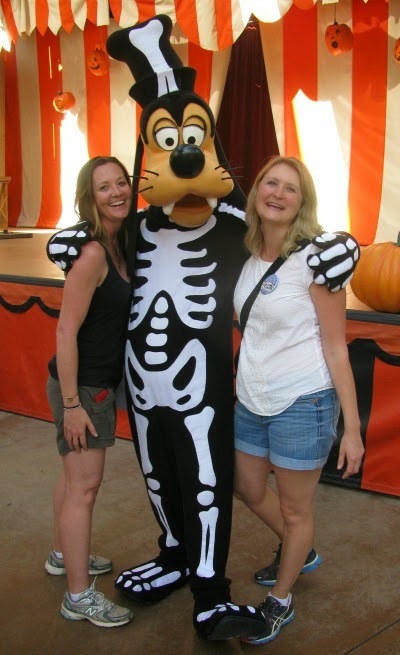 The day she planned to go coincided with my birthday, which seemed especially serendipitous since throughout the previous month I’d felt an inexplicable urge to celebrate at Disneyland, but I preferred to go with a companion and didn’t think I’d be able to find anyone to join me. Despite this seemingly amazing coincidence, I didn’t immediately say, “Hey, I’d love to go with you if you’d like to have company” because the shy girl in me wondered… What if she wanted to go alone? What if she didn’t want to hang out with me? What if she would feel obligated to say, “yes”? But then I remembered the Seder and how I’d spent two decades lamenting giving in to fear. So, I gathered my courage, held my breath, and asked. We ended up spending two amazing days at Disneyland, and it was some of the most fun I’ve had in a very long time. And, in the process I made a lifelong friend. Feeling the fear but doing it anyway can be scary as hell, but when you speak up for yourself and ask for what you want, miracles can and will abound. 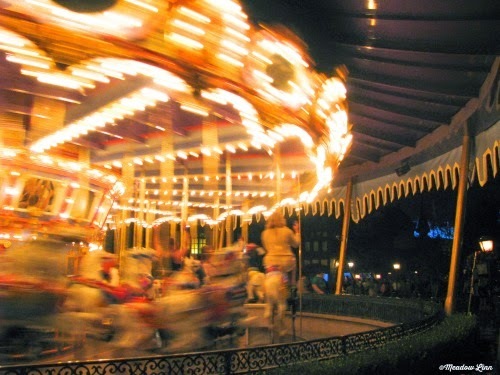 Expanding your horizons need not be grandiose; it can be made up of seemingly small moments. 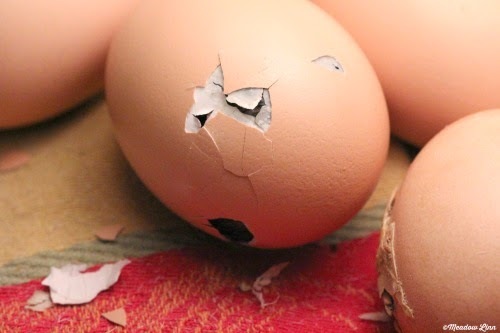 A chick doesn’t break out of its shell all at once. It can take up to 24 hours of tapping and pecking before the egg breaks open and the chick is born into the world. When in your life have you let fear be your guiding light? When have you been too shy to speak up and ask for what you want? What has prevented you from standing up for yourself? The next time an opportunity arises to choose joy over fear, take the step toward joy. Your palms may sweat and your pulse may race, but you’ll never know what awaits you until you try. Although the Cowardly Lion has innate courage that he just doesn’t realize, the special elixir (a medal in the movie) from the Great Oz suddenly makes him able to do the things he didn’t think possible. 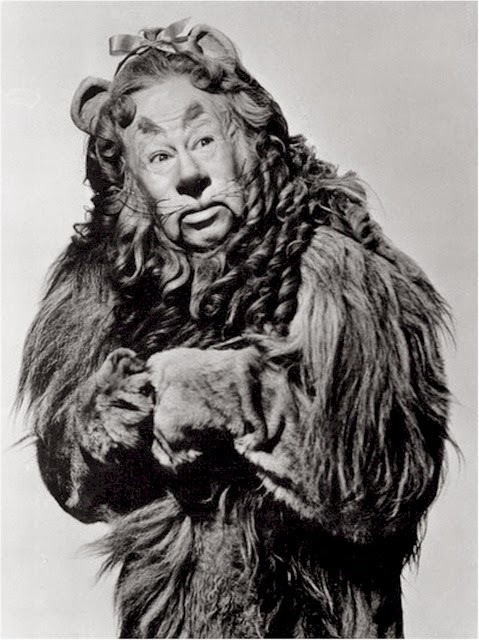 Like the Cowardly Lion, you are courageous. You have the ability to push your boundaries and expand your horizons. Within you is the capacity to feel the fear and do it anyway. Yet, sometimes it can be helpful to have a bit of encouragement. 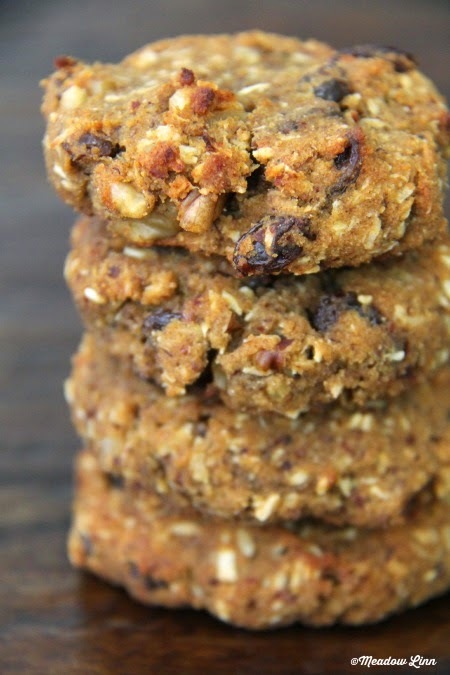 When you make these cookies with the intention that they will help you overcome perceived obstacles and be able to speak up and ask for what you want, so it will be. With each bite, courage will fill you. 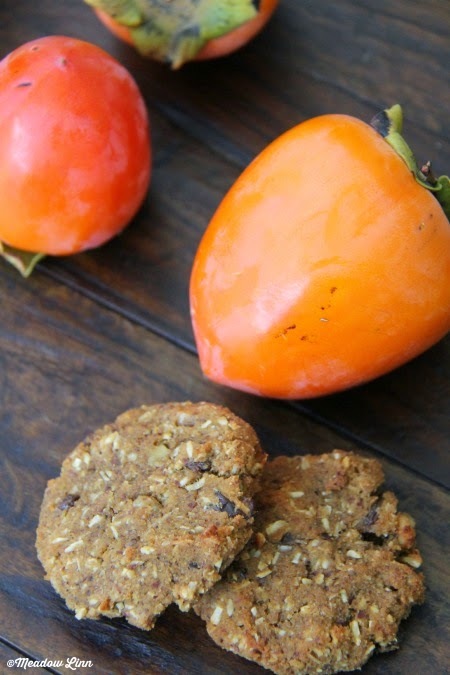 This recipe is based on my Great Grammie D’s persimmon cookie recipe, though she probably wouldn’t recognize it since I made a number of changes and substitutions to make these cookies gluten-free, grain-free, dairy-free, and sugar-free. Don’t tell the rest of my family, but I think I prefer this version. In the bowl of a standing mixer combine the almond meal, coconut flour, baking soda, salt, cinnamon, cloves, and nutmeg. 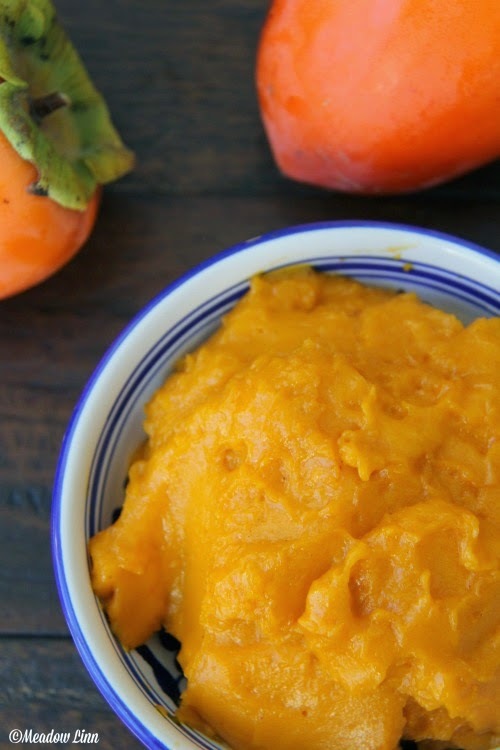 Add the persimmon curd and eggs and blend on medium-low until fully combined. By hand stir in the walnuts, coconut, and raisins. Use a soupspoon to scoop balls of dough the size of a ping-pong ball. Roll the dough in your palms and then gently flatten on the baking sheet into a round disc. These cookies will not spread much in the oven, so form them to your liking before baking them. Bake approximately 18 minutes, or until golden. Remove and cool on the baking sheet for a few minutes before transferring to a wire rack to cool completely.